One of the lesser-known roles of a Hong Kong Jockey Club Apprentice School student is jockeys' room assistant. The youngsters watch and learn, get used to raceday routines, but also act as gopher for the senior jocks, fetching towels, water or whatever is required. This is where, in 2008, Vincent Ho Chak-yiu, during gopher duty on International Jockeys' Championship night at Happy Valley, turned star-struck teenager and summoned up the courage to get an autograph off superstar rider Christophe Soumillon. This Wednesday, exactly six years to the day, Ho will look across that same room and see the charismatic Belgian, a winner of big races the world over and fresh off his victory in last week's Japan Cup. But this time, Ho will see Soumillon not as hero, but as one of his 11 rivals in the 2014 Longines IJC. "I remember seeing Soumillon that day, and yes, I went and asked for his signature - along with some of the others," said Ho, now 24. "I looked at these guys, going out and riding in front of the big crowd and I thought, I want to be like them. They were my heroes and now I am riding against them." 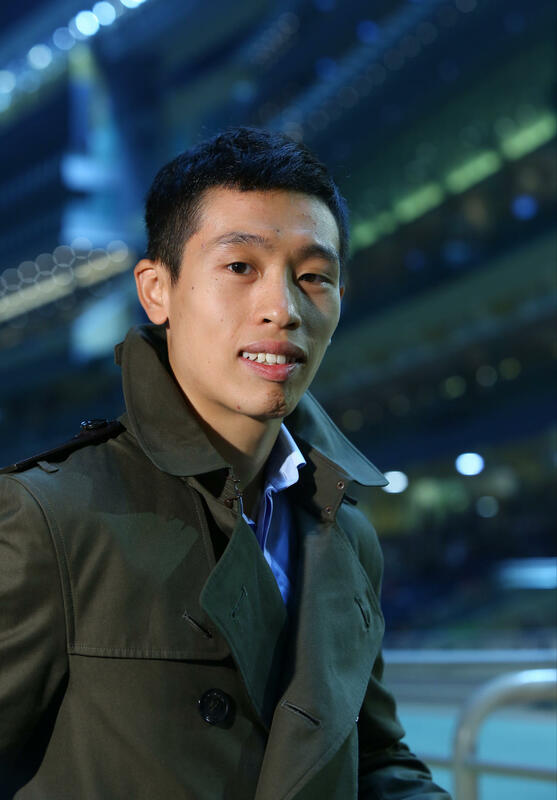 Ho is not your typical Jockey School apprentice, in that he had actually seen a horse before he set foot in the Sha Tin campus as an unassuming 17-year-old in 2007. In fact, he was well on his way to becoming an accomplished showjumping competitor when he was chosen from the 1,000 or so applicants vying for the 20 positions at the school every two years. Most successful applicants meet the criteria of body type - small in stature, and sometimes with an aptitude for competitive sport - but the lack of opportunities for riding horses in Hong Kong ensures instructors are forced to worry about the small matter of developing riding skills later. Growing up in Clearwater Bay, Ho first climbed on a horse in the summer after his first year in high school. He was hooked and spent the weekends honing his craft at Hong Kong's three public riding schools. "Even when I first started I wanted to be a top rider, but there wasn't much money in equestrianism then," he said. "There wasn't really a career-path, like there is now with the Jockey Club equestrian programmes. Maybe if there was, who knows? Maybe I would have gone that way and tried to get to the Olympics." Ho's background in equestrianism gave him an edge and he was soon on his way to New Zealand to gain experience. Ho rode 44 winners in New Zealand, indentured to Lance O'Sullivan, and once unleashed with a 10-pound claim back home with Caspar Fownes, he hit the ground running. Ho turned his first winner into a treble, and won the apprentice title in his first full season with 39 victories. Apprentice school principal Amy Chan Lim-chee said the signs were clear Ho was hungry for success. "He has always been very disciplined and focused, with a very strong mindset," she said. "He was a student full of passion and he knew about his target in life. It was his mission that he wanted to be an international jockey." Riding winners with the huge weight advantage of a 10-pound claim is one thing, competing on nearly even footing with some of the best jockeys in the world is another. So after an injury-affected season in 2012-13 and a sub-par output of 22 winners last term, Ho went abroad in the off season to fine-tune his skills and broaden his outlook, riding trackwork at Chantilly, France. Jockey Club steward and licensing secretary Steve Railton said the benefits of the club-subsidised tours were obvious. "It's not just about riding, it's also about self-development and building confidence," Railton said. "And you can see that he had grown on a personal level, as well as professionally. Kids can go one or two ways here. Some plateau after riding out their claim, but Vincent seems to have the right attitude and he is very ambitious. He doesn't just float along." This season the results have shown on the track. Fownes threw his support behind his former apprentice with a mind to qualifying him for the IJC, providing eight of his 14 winners so far, a return that has Ho sitting fifth in the jockeys' championship. And on Wednesday night, when Ho looks across that jockeys' room and sees Soumillon - along with the "World's Best Jockey", Ryan Moore, and regular rivals Zac Purton and Joao Moreira - Fownes said Ho would be showing the same front as six years ago and taking it to them. "He will be very cool, he'll be in the zone," Fownes said. "I'm sure if he draws some decent rides he will be a big chance, too." For Ho, the IJC is another platform to show local jockeys - often and unfairly thought of as second-rate compared with their foreign counterparts - are worthy of more support from owners, a topic he speaks passionately about. "This is Hong Kong and as local boys we should be the ones at the top," Ho said. "Maybe Moreira and Purton are the best in the world, but we want to show the owners they can support the locals. In other jurisdictions and cultures, owners support the local guys, but not here. "I don't know if it is a racial thing, but owners choose international riders over us. I would like to see the owners support the locals more, but we have to prove we are worthy."